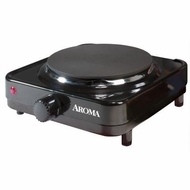 This Aroma Hot Plate is perfect for providing an extra cooking surface when you need that additional burner. It is suitable for almost anywhere: apartments, dorm rooms, at the office, and even camping. Also comes in handy when entertaining guests. This durable cast iron hot plate offers 800W of heating power and a full range temperature control.